There’s nothing quite so satisfying as a pancake, so I eat them all year round. But still get excited about Shrove Tuesday about this time of year. I’ve long ago learnt that my digestion is sensitive to wheat, and indeed refined sugar, but that hasn’t got in the way. 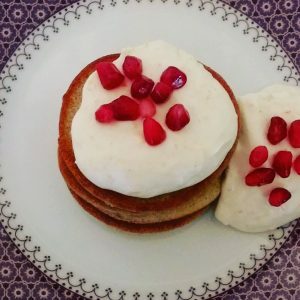 I regularly use buckwheat, brown rice or gram flour, and often use pancakes as a savoury snack or meal. I’ve had so much fun dreaming and cooking these recipes up for you this week. I hope you enjoy them as much as I do. But first, some tips on making your basic pancake batter. Ideally make your pancake batter the night before and leave at room temperature to make the flour more digestible. These pancakes are fragrant, fresh, zesty, and exotic. Pomegranates and oranges aren’t local to me here in the UK, but they are seasonal right now, so at their best. Pomegranates are a great source of antioxidants that help keep the heart and blood vessels healthy. Some specific polyphenols (called punicalagin and ellagic acid) have even been shown to have specific anti-cancer activity. Their vibrant red colour radiates joy, and their high nutrient content beams good health. Pomegranate is rich not just in vitamins and minerals, but also the kind of soluble and insoluble fibre that helps keep your gut and your gut flora in good shape, which means it’s fantastic for your immune system. Make fluffy scotch pancakes with buckwheat flour, coconut milk, and egg and a pinch of bicarbonate of soda. Make spiced orange cream by mixing coconut cream with orange zest, cinnamon, nutmeg, ginger and a little honey. Chill to thicken. Serve pancakes with spiced orange cream and sprinkle with pomegranate for jewelled effect. Mushrooms are indeed mighty, especially the medicinal mushrooms that have been used for centuries in the East and are gaining popularity in the West. Mushrooms such as reishi and shitake contain glucans which stimulate your immune system. Such activity has even been shown to have an anti-tumour effect. 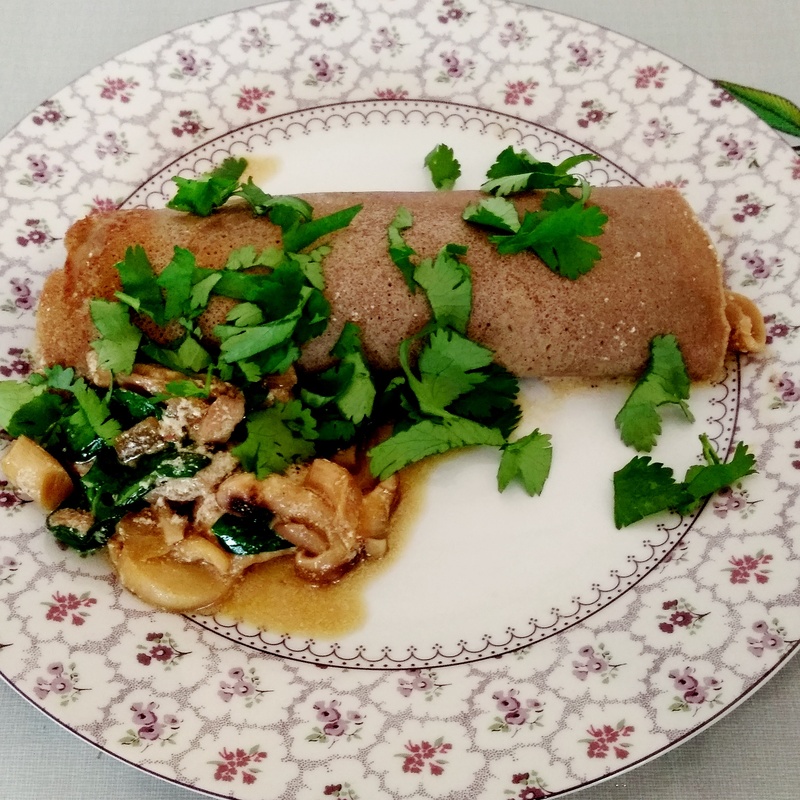 You can make these pancakes, with any mushrooms, however, and they will be as tasty. There’s very little that beats a savoury pancake when you get the filling right. PLUS add a couple of teaspoons of shitake or reishi mushroom powder to the batter to fortify it with immune-boosting properties. Stir fry a blend of mushrooms (include shitake, reishi or other medicinal mushrooms if you can) with onion, garlic, coriander, nutmeg, turmeric and black pepper, stir in either coconut cream or plain yoghurt, season with tamari and wilt in some spinach or kale. Use as filling for savoury crepe and garnish with fresh coriander. This is decadently sweet and gooey but with no refined sugars or dairy cream – a surefire hit with the kids or anyone with a sweet tooth. 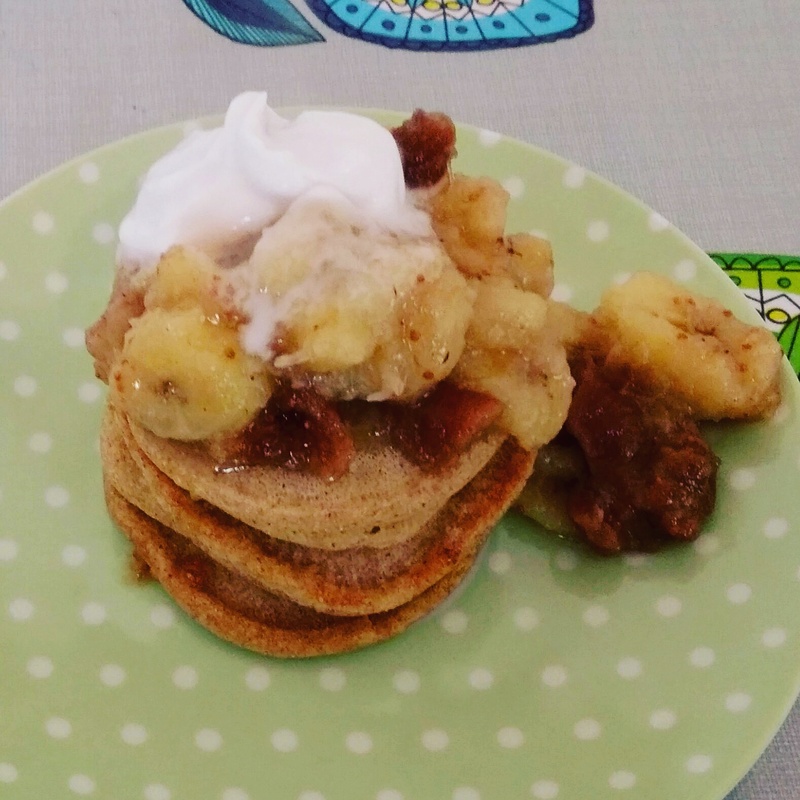 Both bananas and figs have quite a high sugar content as well as being packed with flavour, so you won’t need much to dress your pancake stack. They are also both rich in dietary fibre, with the same gut and immune system benefits enjoyed by pomegranates, as well as potassium. Potassium is a key electrolyte that helps keep you hydrated and is important for your muscles, nerves and heart. Simmer slices of banana with chopped up dried fig (1 fig per banana) in a little coconut, rice or nut milk until thick and caramel-like. I sometimes add cinnamon too.